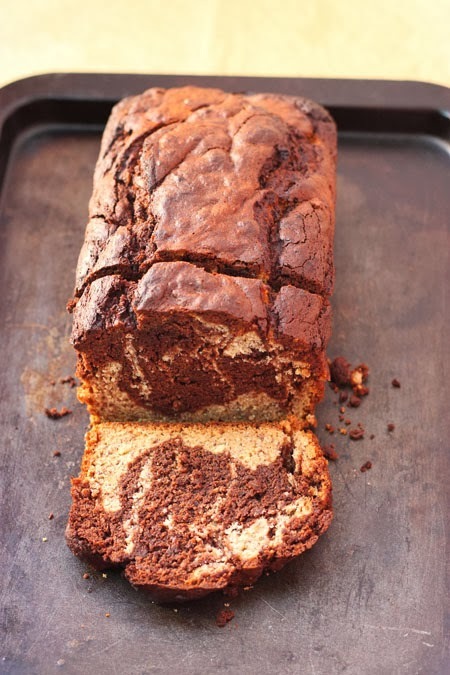 I realize that Banana Bread is great on its own, so just excuse me while I swirl chocolate all up in it. I really can't help myself and I don't feel bad about it at all. Bananas love chocolate. Can you blame them? Banana + Cup of hot fudge + Cup of chopped peanuts. Oh yeah, I went there. I went there all the time and it was glorious. I’m about to go there right now. 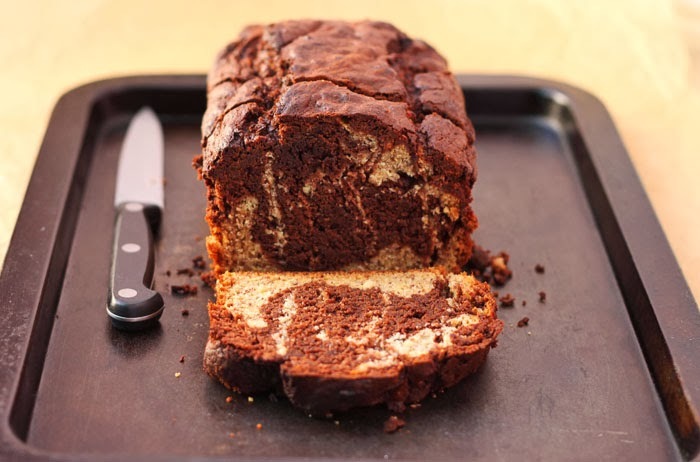 The chocolate part of this Chocolate Swirl Banana Bread is made by mixing a portion of the banana batter with an equal amount of dark chocolate. You can probably imagine how this creates the most tender, almost fudgy, melt-in-your-mouth crumb. People will fight over the chocolate bit, especially the crust. It might get dirty. Just warning. If I were the banana batter bit, I’d probably be feeling a little insecure at this point. The butter goes into this batter soft, not melted. That’s to encourage a bit more structure and height in this loaf. You might notice that the wet mixture might look a bit curdled or separated after the eggs go in, but that’s ok because it will come together once the flour gets incorporated. It’s not like a cake where separation would negate the aerating effect of creaming and throw away your dreams of a soft and fluffy butter cake. 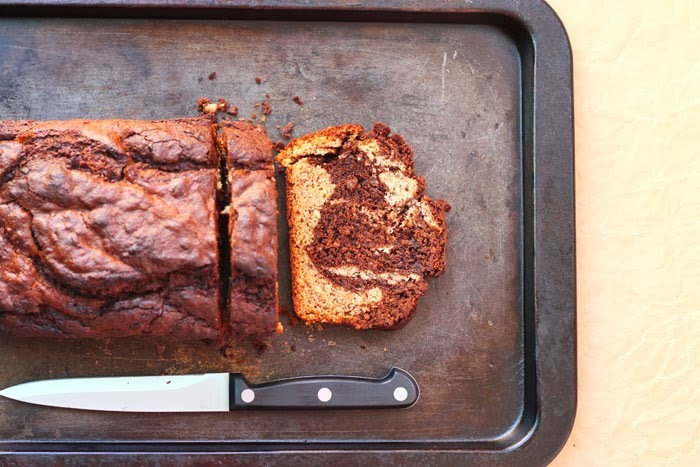 Banana Bread is less serious. I sort-of snark at banana bread recipes that start with “beat the butter with sugar…” I usually stop reading after that part. Creaming is the first step in making cakes, not quick breads. I feel like it would be cheating and those recipes should be called banana cakes. 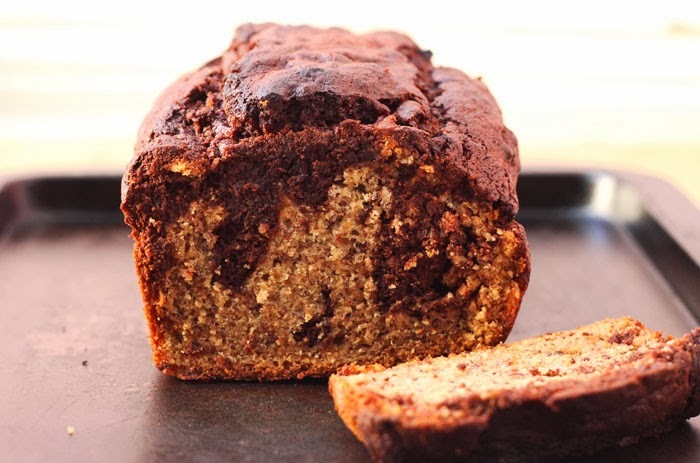 A true banana bread is a quick bread, which means it uses the simple technique of mixing wet ingredients and mixing dry ingredients and then combining them gently to form – a rather lumpy – batter. It is supposed to be fuss-free and fast. It’s the ingredient proportions that determine the quality of the loaf and less about the technique. It is not often I admit "less about technique" over here. I'd say it's quite appropriate for a lazy Sunday. Preheat your oven to 180°C. Line a 9x5-inch loaf pan with baking paper and set aside. Mash bananas well in another medium bowl with the back of a fork. Add the sugar and soft butter and beat with an electric hand mixer until well combined. Beat in eggs, one at a time, and then beat in vanilla. The mixture might look a bit curdled at this point since the butter is soft, but that’s alright. Add the dry ingredients and stir it in gently until combined. The batter will be thick. Pour most of the batter into the prepared pan, reserving about ¾ cup. Add melted chocolate to the reserved batter and stir to blend. Dollop the chocolate batter over the banana batter and use a butter knife to swirl it in eagerly to marble the two flavours together. Bake for 55-60 minutes, or until a toothpick inserted into the center comes out clean. Transfer pan to a wire rack and let the loaf cool in the pan for 10 minutes. Remove loaf from the pan and place on the wire rack to cool completely. Start fighting over the chocolate crusty bit and enjoy. I make a Nutella, peanut Butter, cream cheese spread that would be great on this! I think you helped me once at Baskin Robbins. If not we love the same combinations. And this one looks lovely!